Crown thinning is a pruning technique primarily used on hardwood trees. Crown thinning is the selective removal of stems and branches to increase light penetration and air movement throughout the crown of a tree. The intent is to improve a tree's structure and form whilst still retaining its natural beauty making this an ideal technique for gaining more light without causing harm. To avoid unnecessary harm to the tree no more than 25% should be removed, removing more in some trees will result in large amounts of epicormic growth the following year only worsening the issues of light and thus rendering the treatment ineffective. Crown raising is simply removing branches from the bottom of the crown of a tree to provide clearance for pedestrians, vehicles, buildings or lines of site. This technique is often used with trees bordering from a property onto a public highway/carriageway protecting the owner from liability of a pedestrian walking under the trees. This technique can also enhance a trees shape but only should be carried out to 1.5-2m on a young small tree (up to 6m height), 2-4m on a medium tree (up to 12m height) and 2-5m on large mature specimens (12-35m in height). On larger specimens crown raising can sometimes be a better/healthier alternative to crown reduction for increased light penetration to a property. Crown reduction pruning is most often used when a tree has grown too large for its permitted space. This method, sometimes called drop crotch pruning, is preferred to topping because it results in a more natural appearance, increases the time before pruning is needed again and minimizes stress. Crown reduction pruning should only be used as a method of last resort. This pruning technique often results in large pruning wounds to stems that may lead to decay. This method cannot be carried out on all species of trees as some react badly and as a result will go into decline. A far more acceptable alternative to overall crown reduction which can be applied in various scenarios. The same basic pruning principals which are used in reductions are adopted (the cutting of branches to secondary growth points) but instead of reducing the whole crown selected branches only are reduced. This technique can be used when a small number of branches protrude from the natural canopy line, for aesthetic reasons these branches can be reduced back into the canopy line leaving a well balanced shapely appearance. Or for safety reasons when concerns have arisen for a branch to appear to heavy it can be reduced to reduce the risk of limb failure. Cleaning out is defined as the removal of dead, dying or diseased branchwood, broken branches, or stubs left from previous tree surgery operations together with all unwanted objects, which may include fungal fruit bodies, ivy and/or other climbing plants, nails, redundant cable bracing, rope swings, tree houses and windblown rubbish from the tree, and any such debris from any cavities with the tree. Traditional method often used in woodland management. Young tree stems cut down to ground level. The subsequent new growths are cut on a cyclic basis; this process is repeated over a prescribed number of years, normally 5-15 years. Commonly used on species such as Hazel and many shrubs. Dead-wooding is defined as the removal from the tree of dead, dying or diseased branch wood, broken branches or stubs left from previous tree surgery operations and from within any cavities within the tree. Formative pruning is defined as the pruning of the aerial growth of a tree in its youth to result in an appearance considered typical for the species or variety of tree concerned. The object of formative pruning is to produce a clean stemmed tree and the establishment of a good branch structure and canopy by the removal of a number of small branches leaving therefore only small, quickly occluding wounds. Root pruning may also be undertaken as part of formative pruning. 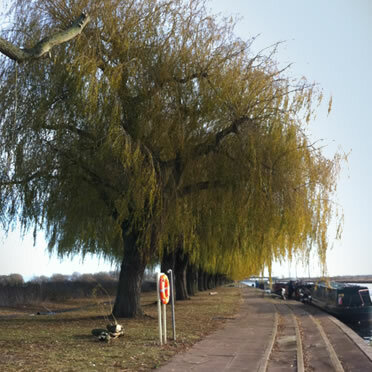 Pollarding is described as the removal of all tree growth of a tree back to the main stem to the height above the ground specified in the schedule of works, with the objective of producing a quantity of vigorous shoots from the bole. This technique is commonly used on Lime, Willow and Poplar trees. Some trees can have structures susceptible to climatic damage. For example, cedars tend to produce plates of foliage at the end of a branch and such branches hold snow and may snap under the weight. It is not uncommon for repeated fractures to occur in such trees and as a result pruning or removal of the tree can be more appropriate than bracing. The upright branches of cypresses can be permanently displaced by snow. Such branches can be supported with bracing or they should be pruned out. This can be done in numerous ways depending on the site location. 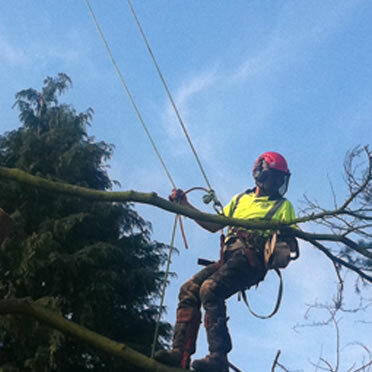 Straight felling – normally carried out within forests, on commercial jobs or within large garden. A cut is made at the base of the tree called a sink/ gob towards the direction of felling, after this the back cut is made sending the tree in the desired direction. Section felling – normally adopted when the tree is in a confined space or growing over something (eg sheds, greenhouses, fences). In these situations the tree is dismantled in small sections. Section felling using rigging techniques – rigging is normally used on the larger trees and involves placing a pulley block high in the canopy and an anti friction device at ground level to which through this a lowering rope is passed controlling the decent of removed branches. Section felling with the aid of a crane – used only as a last resort when none of the above techniques can be adopted as cost implications can be very severe. Removal of the stump after tree felling allowing us to replant you another tree in the same position or allowing us to top soil and re-seed/turf the area in which the tree stump was positioned. As well as the large stump grinder we also have a stump grinder built to travel between the average gate allowing us to grind stumps in rear gardens also. Hedge trimming should usually be carried out on a yearly basis however to acquire the perfect hedge this may need to be done twice a year for up to three years to achieve this. Quite often this is carried out when the hedge has been left to grow too such a point little or no light is reaching your property, in this situation we can reduce the hedge by up to 50% ensuring you are left with a hedge which is still pleasing to the eye. Under the Occupiers Liability Act 1984 you have a duty of care to ensure your trees are safe. Ignorance is, seldom, any protection! Statute law does not require the tree owner to maintain completely safe trees, and it is certainly not practical or possible to inspect each tree on a daily basis. The duty only requires the tree owner and those responsible for them "to take reasonable care". If you own land, want to develop land, or are thinking about buying a particular piece of property, then you are going to need a tree survey. 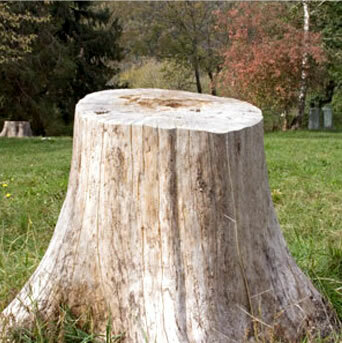 Simply put, a tree survey is an inspection of all the trees, shrubs and vegetation on the piece of land. This inspection collects a range of information about the trees. It is done through a systematic approach to find any and all defects, as well as information regarding the trees. Tree surveys are completely impartial and can help you figure out anything from what type of tree is on your land to whether or not there are any tree hazards. A tree survey will help you manage your trees as well as give you valuable information as to the age, condition and type of trees you have.